Key Difference: LAN stands for Local Area Network. It is a type of data communication network which is limited in geographic scope. In LAN, the devices communicate over a common communication channel allowing moderate data rates. Ethernet is a technology that is widely used in LAN. It is specified in a standard called IEEE 802.3. It is a technology that provides data link and physical specification to control and manage access to a shared network medium. 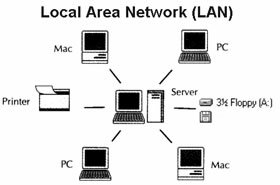 LAN stands for Local Area Network. It is a type of data communication network that connects devices that are relatively close to each other. It uses a network media for the connection. LANs are considered to be faster and more reliable than wide area networks. LAN network can be seen in a limited physical area like an office, laboratory or college campus. LAN can be simply considered as a combination of certain hardware and software. Hardware includes stations, transmission media and connecting devices like wires, etc. Software for LAN are basically of two types – Networking Operating System and Application Programs. Generally, a LAN network is owned by an organization that uses it. It works best for relatively short distances and at relatively high bit-per-second rates. There are three basic physical topologies of LAN - ring, bus and star. LAN can be organized in many forms. For example- in a client server model, a client connects to a server in order to perform some types of services like sending email, etc. On the other hand, in peer to peer type of model no specific role of client or server is provided and thus the role can change from time to time. Ethernet is a technology that is widely used in LAN. It is specified in a standard called IEEE 802.3. It is a technology that provides data link and physical specification to control and manage access to a shared network medium. Over the years, it has emerged as a widely used technology for the LAN networking. It was developed by Xerox in 1970. This was the original form of it and was standardized as Ethernet Version 1 by three companies- DEC, Intel and Xerox. Later in the mid 1980’s, IEEE published a formal standard for Ethernet which is known as the IEEE 802.3 standard. It is a type of data communication network which is limited in geographic scope. In LAN, the devices communicate over a physical communication channel allowing moderate data rates. Ethernet is a technology that is widely used in LAN. It is specified in a standard called IEEE 802.3.